On our way home from Bending and seeing the 1st Tiny House exhibition, we decided to stop in Castlemaine for a quick ice cream. The ice-cream social is located on the corner of Hargreaves St and has a retro 50's kind of feel and fit out. 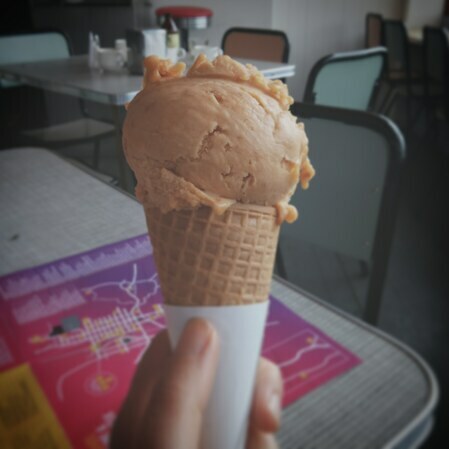 They are known for using fresh seasonal ingredients and for combining unusual flavours making small-batch ice cream. Thought of trying the Apricot and Earl Grey flavour combination. This was a perfect summer flavour, fresh and fruity with an Earl Grey tea infusion flavour. Good news is they are opening their new ice cream shop in Thornbury on the 5th April and will be giving away $1 ice creams. So to keep up to date visit their website or Facebook page.